In a far-ranging conversation with host Marvin Kalb April 17, Supreme Court Justice Antonin Scalia said the high court is the least qualified of the three branches of government to decide whether the National Security Agency should be allowed to maintain surveillance on the American people but Justice Ruth Bader Ginsburg said the court had no option but to rule on whatever comes before it. “We can’t run away and say we don’t know much about that issue,” Justice Ginsburg said. 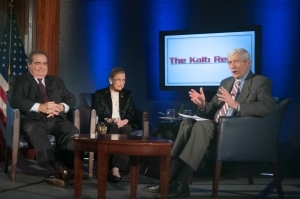 Scalia and Ginsburg, who are polar opposites on many of the major issues that come before the court, joined Kalb for the final program of the 20th season of “The Kalb Report." Deciding how much authority should be given to the NSA is a question of balancing the emergency with the intrusion, Scalia said. When the emergency is high enough, he said, more intrusion can be justified. Asked whether the justices could call the president and ask him, both justices recoiled. That is not how the court works, they said. Justices must rule on what information comes to them. They cannot seek their own information, they added. “We are at the mercy of the information that people bring to us,” Ginsburg said. In talking about freedom of the press, the justices disagreed on the landmark 1964 New York Times v. Sullivan decision that shielded the news media from libel when reporting on public figures. Even though it was approved unanimously, Scalia said he believed it was a wrong decision. But Ginsburg said the decision must be put in the context of the time it came to the court. Both Ginsburg and Scalia said they oppose proposals to allow the Supreme Court’s oral arguments to be televised. “If I really thought it would educate the American people, I would be in favor of it,” Scalia said. But people would not watch cases from gavel to gavel, he said, and they would not watch the many boring cases where the court struggles to interpret laws. Televising a trial makes sense, Ginsburg said, because all of the information unfolds during the trial. But a Supreme Court case is different, she said, because most of the information is not presented during the hour-long oral argument but in briefs justices consider in chambers. But, she said, televising the oral arguments “probably is inevitable” because of the pressure to do it. "The Kalb Report" is a joint project of the National Press Club’s Journalism Institute, the University of Maryland University College, the George Washington University, Harvard’s Shorenstein Center on the Press, Politics and Public Policy, and the University of Maryland’s Philip Merrill College of Journalism.